In English, you can say a dish is hot and spicy. "Hot" refers to the burning sensation from chilli and "spicy" is being flavoured with or fragrant with spice. I know in Khmer you have a specific word for hotness of chilli and another for temperature. Using the "hot" for temperature when referring to dishes will not make sense. In French, is it valid to use "chaud" to refer to hotness of chillis (i.e. the burning sensation and not temperature)? Is there a one-to-one equivalent translation of "hot and spicy"? I can say that the right word, as far as culinary art is concerned, appears nowhere in your question. The term for "hot" would be more specifically "piquant": a hot spicy food → de la nourriture fortement épicée; one is never too sure what is meant by "épicé": it can be "piquant" (that is stinging on the tongue and palate) or it can mean that it has strong spices, such as curry that isn't spicy in the way that hurts your mouth. For the time being, "chaud" is to be banished from your French vocabulary in the way of rendering the adjective "hot", except in the context of actual heat, as corrected @Luke Sawczak in the comments. the electric line is hot → "il y a le (du) courant" ou (substandard) "il y a le jus"
However, you might — before long if not already — be able to translate "hotline" by "ligne chaude" and similarly for a few others. "Hotline" is now part of the French vocabulary. In French, is it valid to use "chaud" to refer to hotness of chillis (i.e. the burning sensation and not temperature)? It is more than unlikely to be used. Chaud essentially relates to the food temperature when applying to dishes. However, we might say en feu to describe the feeling: avoir la bouche en feu. Is there a one-to-one equivalent translation of "hot and spicy"? We use fort (strong, opposed to doux: sweet/soft) for hot food like in moutarde forte/douce or piment fort/doux so "hot and spicy chillies" would be piments forts et épicés. Ce plat est (très) relevé. Note that while picante is the main word used to translate hot (chillies) in Spanish (as you already know) and fuerte a much less used alternative, this is the opposite with the French corresponding words piquant and fort. Pour un plat piquant à cause d'un piment, on peut aussi utiliser l'adjectif "pimenté", tout simplement. L'adjectif "relevé" est aussi une solution. Par contre, je confirme que "chaud" ne s'emploie pas dans ce contexte. En ce qui concerne la température, il me semble que "hot" correspond à une température élevée (mais je ne suis pas anglophone). Je traduirais donc par "brûlant" (pour un plat solide) ou "bouillant" (pour un plat liquide) si le but est de prévenir une brûlure de la langue en mangeant. 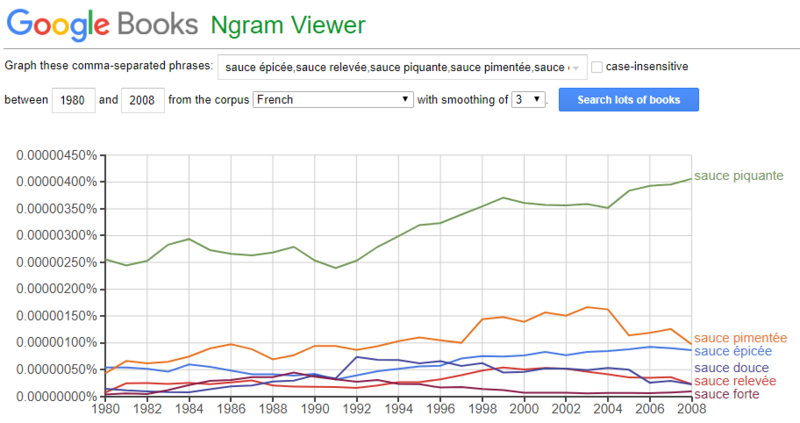 Shame on me for thinking it necessary to offer some colorful (read: “arguably gutter-talk”) options to go with all the excellent answers given so far, but the often not-so-nice (when applied to humans) word gueule (= la bouche= “mouth”), figures in several descriptive French expressions I’ve heard/used involving spicy hot foods (and the strong/harsh alcohols of my youth). arrache-gueule is [apparently derived and] commonly used as an adjective to refer to very hot (spicy) food. "Cette sauce est plutôt arrache-gueule." Avoir la gueule ferrée can have the same meaning as the above expression using pavée. Not the answer you're looking for? Browse other questions tagged usage alimentation or ask your own question. How to say 'deep fried' in French? What other verbs can be used in the exclamatory expression “Regardez-moi ça !”? What is French translation of English 'ready meal'?